Check out our Letter F book list! We’ve included 10 great books, including fiction and nonfiction, to reinforce your child’s love of the Letter F! Beginning with the inside cover, Fire Engine No. 9 includes pages of fire-related pictures with the name of each object, thereby creating a fabulous fire-related picture glossary. The story itself begins when the fire alarm goes off at the the fire station. Readers will follow the firemen to the fire, watch as they try to put it out, and cheer as they rescue someone! There’s even a helpful section on fire safety tips that you can read with your child. With lots of action and sound words and bold illustrations, this is a perfect book to read while learning about the letter F! Dr. Seuss is a beloved children’s author, and we are so glad to not only have one, but two books of his for the letter F! 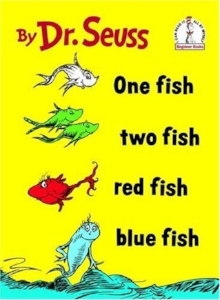 One Fish Two Fish, Red Fish Blue Fish will get you and your kids giggling with its silly phrases, tongue-twisters, color words, made-up words, crazy Seussian creatures, and even crazier illustrations! It’s sure to engage your little ones! This classic Dr. Seuss book features simplified text that’s great for young readers and children building vocabulary, such as “Wet foot, dry foot, high foot, low foot.” And of course, it wouldn’t be a Dr. Seuss book without silly phrases, crazy illustrations, and lots of fun! Check it out! One of a series of Froggy books, in Let’s Go, Froggy!, Froggy and his dad decide to go on a bike trip and a picnic. Children will enjoy Froggy and his dad’s silly antics as they struggle to get ready. There are also plenty of great sound words, like “zip,” “zap,” and “zoop” as Froggy finds what he needs. Let’s Go, Froggy! also includes lots of dialogue (and lots of good-natured yelling): “FRRROOGGY!” “I’m r-e-e-a-d-y!” This book is a great choice to read aloud with your children! Parents may remember the Frog and Toad series from their youth, and for good reason! These stories are great for early readers. Frog and Toad are Friends includes five separate short stories about Frog and Toad, with each story organized as its own chapter. Frog and Toad stories are often humorous, with great characters and big personalities, but best of all, they remind us of the value of true friendship. Just another reason to choose this book for the letter F! This book sparkles, people! Need we say more?! All right, fine. The Rainbow Fish is a story about a little fish with beautiful rainbow scales. But when others ask to share his gorgeous scales, he always tells them no. As a result, the Rainbow Fish ends up alone and questions how he can be so beautiful and yet so lonely. He finally seeks advice from a wise octopus, who helps him discover how to be truly happy. This is a cute story with a lovely ending—and did we mention sparkles?! In I’m a Frog! Elephant and Piggie head off on yet another hilarious adventure. In this story, Piggie declares, “I’m a Frog!,” much to Elephant Gerald’s shock. As Gerald tries to figure out what’s going on with his friend, he begins to worry that he, too, will turn into a frog! Readers will delight in the back and forth dialogue and humorous actions of these two lovable characters. The fun plot is also a reminder of the importance of pretend play and using your imagination—a great story your children will love! Though a nonfiction text, Frog Song reads like a story and includes beautiful illustrations of frogs and their varied habitats. From ponds, to the rainforest, the Great Plains, and even a desert, you and your child will find there’s plenty to learn about frogs and their diverse environments. Facts and sound words abound, like “BRACKBRACK” or “CHIRP-CHWEET!” Your children will enjoy learning all about these amazing creatures! Another great nonfiction book that reads like a story, Farm takes readers on a class field trip to the farm! Perfect for young readers, the book is organized into a few short chapters and includes both an index and a “To Learn More” section. There’s also a picture glossary with farm vocabulary and helpful “Ideas for Parents and Teachers.” The photographs are bright and bold. With its simple and child-friendly text, this is a great choice! Fish is part of the My First Animal Kingdom Encyclopedias series. It is organized into almost fifteen chapters, with each chapter encompassing a two-page spread. Each spread includes bright photographs and TONS of content-related vocabulary. Each chapter also includes an organized section of words related to specific aspects of fish: food and diet, senses, or swimming, to name a few. These specialized vocabulary lists include words like “swim bladder,” “gill,” “slime,” and more. Each word also includes a pronunciation guide and brief definition of the word in simplified, child-friendly language. If that weren’t enough, most words also include a picture, and there’s even a section devoted to things that seem like fish, but aren’t! Take a look! We hope you’ve enjoyed our top 10 books for the Letter F! For more letter-themed ideas, including letter-themed crafts, snacks, and activities, check out our letter blog posts, like the Letter F post. And don’t forget to subscribe, so you can be the first to see our future letter book lists!! We've got a lot of fun letter F ideas for you! Try some of these crafts or activities to reinforce the letter F sound. Fishing for letters is an easy and engaging game to encourage letter sound practice. Tie a piece of string to a stick or spoon to make a fishing rod, and hot glue a magnet to the end of the string. Then cut out paper fish and attach magnetic letters (or just write letters on the paper fish and attach a paper clip to each). Now it’s time to let your child “fish” for letters! Each time they catch a fish/letter, ask them to name the sound associated with the letter. This is a great way to both practice the letter “F” and review previously-learned letters! F is for fireman! Make this creative craft with your kids or students as you learn all about the letter F.
Create the adorable flamingo from ABC See, Hear, Do! It’s a great way to reinforce the letter F sound while having creative fun with your kids or students! F is for farm! These simple farm animal crafts might get your kids mooing and neighing, but they will also help to reinforce the letter F sound! Draw and color a variety of farm animals on cardstock, cut them out, and glue on clothespins so they stand. Now it’s playtime! Fruit + Faces = FUN (with a capital F)! Create fruit faces on a plate—the sillier, the better! While you and your kids giggle your way through this snack, don’t forget to reinforce that letter F sound! In case you missed our previous posts, check out the links below for the letter C, A, T, M, S, R, I, P, and B ideas, crafts, and activities! And don’t forget to subscribe, so you don’t miss any more great letter crafts and activities!